Along with his lessons on how we can become better people, Fred Rogers taught us something about clothing. Each of his “Mr. Rogers’ Neighborhood” episodes started the same way: he’d come home from some unseen outside world, hang up his sport coat in a closet, and then reach for one of his signature cardigans. The message was subtle, but there: changing into simple, comfortable clothes can be a way to hit the refresh button. 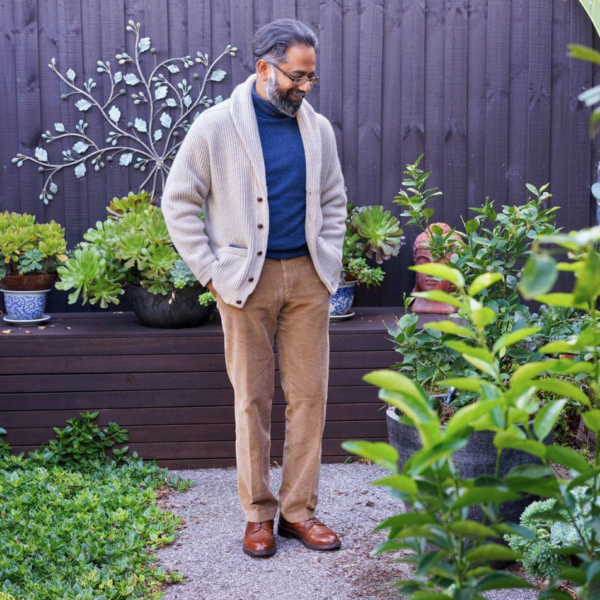 By trading stiffer jackets for softer knitwear, we shrug off the day’s stress. 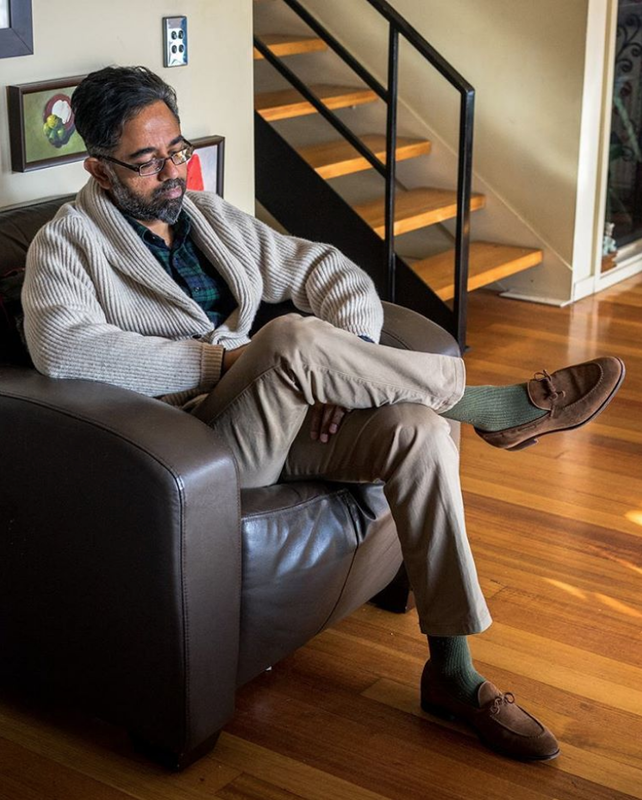 My own at-home uniform is similar, although not nearly as charming as Mr. Rogers’. I wear either a white t-shirt or light blue button-down with 3sixteen jeans, Town View moccasins, and a chunky, shawl collar cardigan. 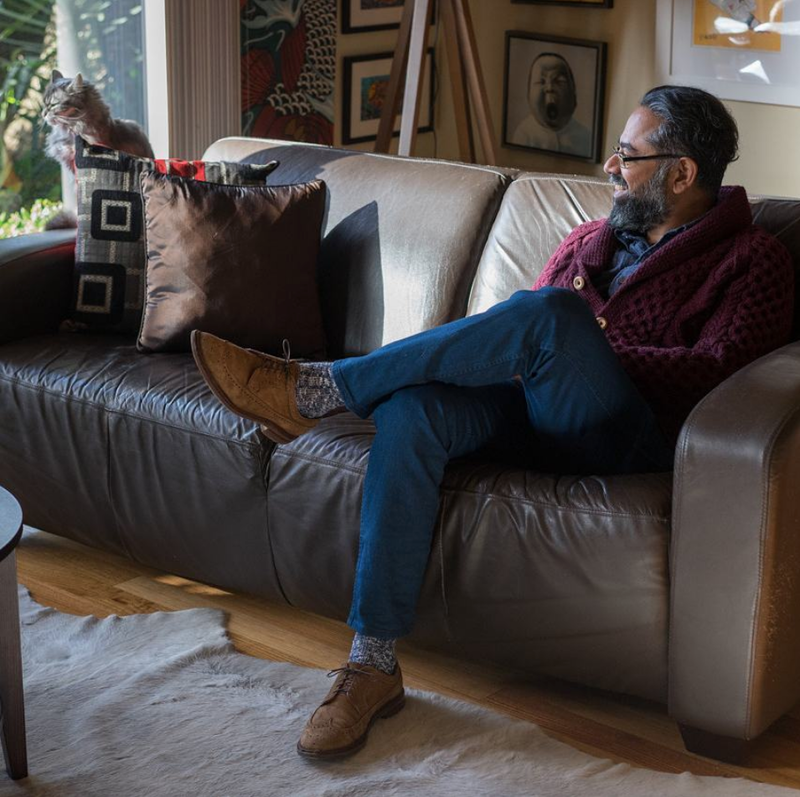 The cardigans are plush, multi-ply lambswool pieces, which make them feel like comfy blankets. Slip one on and you’ll instantly feel more relaxed at home – not to mention save on heating bills. 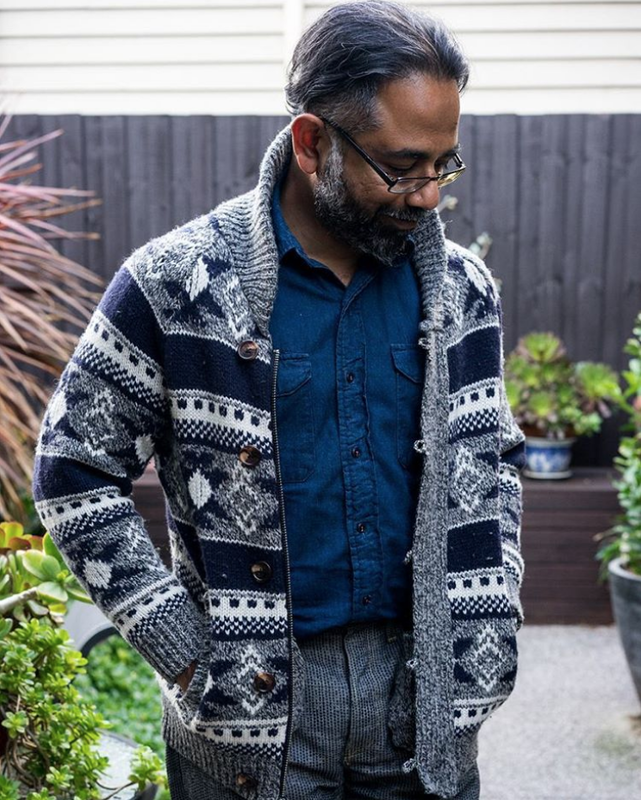 Our friend Gerry in Melbourne has also posted some really great examples on Instagram of how you can wear a chunky cardigan at home. Like me, he prefers to wear these more casually. Sometimes guys layer these over dress shirts and neckties, which can look fine, but also at times a little contrived. 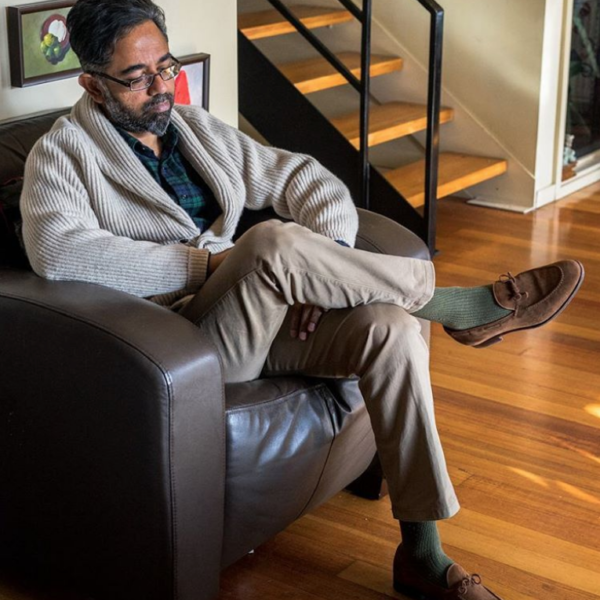 Instead, I think they look better the way Gerry wears them here — with casual shirts in chambray, tartan, or brushed cottons, or sometimes even layered over a thin turtleneck sweater (knit on knit is a great move, so long as the outermost piece is the heavier one). Gerry also wears his cardigans with everything from chinos to corduroys to five-pocket jeans, along with rustic shoes such as boots or more causal slip-ons. 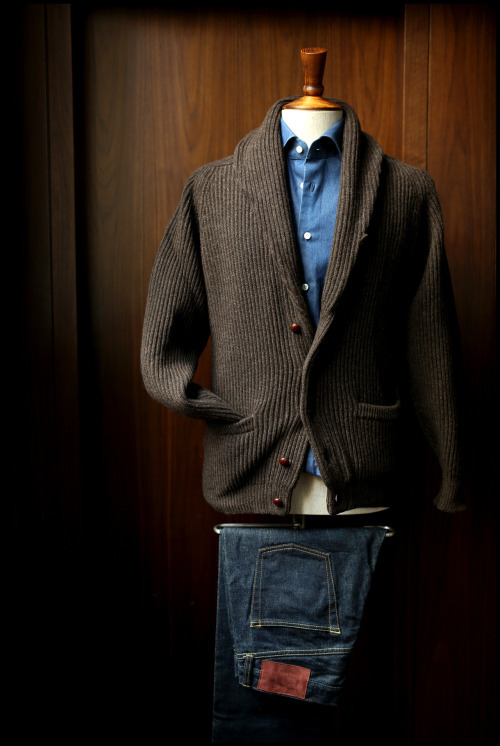 The ensembles feel easy and natural, while the cardigans serve as alternatives to a more formal tailored jacket. If you’re looking to buy a chunky cardigan this winter, start by thinking about how you’ll use it. 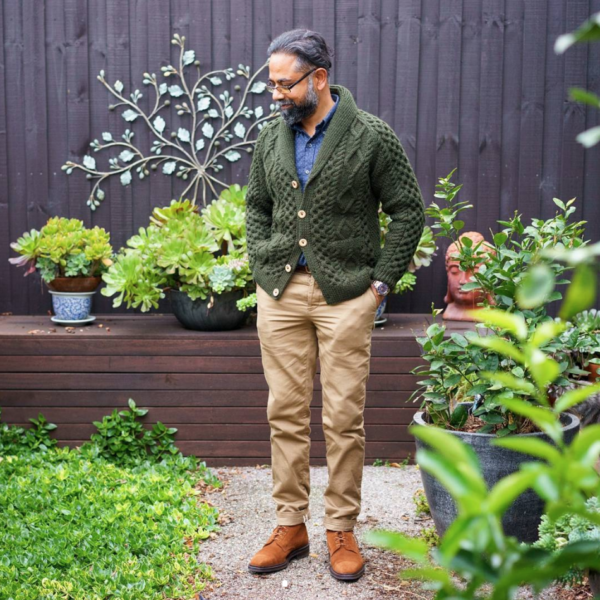 Certain companies make nice, versatile knits that can be worn with almost anything, while others have a more rugged, outdoorsy feel. For the classic cardigan you’ve probably seen in photos of Steve McQueen, look to companies such as William Lockie, Scott & Charters, Drake’s, Ben Silver, O’Connell’s, The Andover Shop, The Wardrobe Wimbledon, and The Armoury (the last of which is pictured above). Theirs are probably the most versatile, meaning they can be worn with dressier trousers or jeans, although you’ll want to pay attention to the silhouette. Some will have a fuller fitting, elongated body, with a thick collar that hangs like a roll of dough. Those will feel more like outerwear. Others will be a bit shorter, trimmer, and overall more rounded looking, which some will find easier to wear. I like both styles, but they feel and look different. Such cardigans tend to be soft and plush, and for me, often feel like they’re better suited for wear around the house. For something you can take to the great outdoors, try a cowichan instead. These are Native Canadian sweaters, almost always hand-knitted, and feature a zip front and rounded collar. The wool is typically thick and scratchy, but that’s part of the charm. 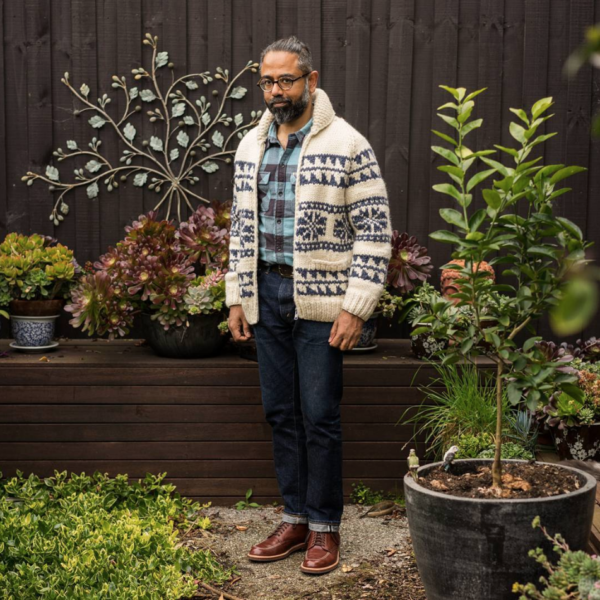 Kanata and The Canadian Sweater Company make some lovely ones (the second which can also be found at Granted Clothing). 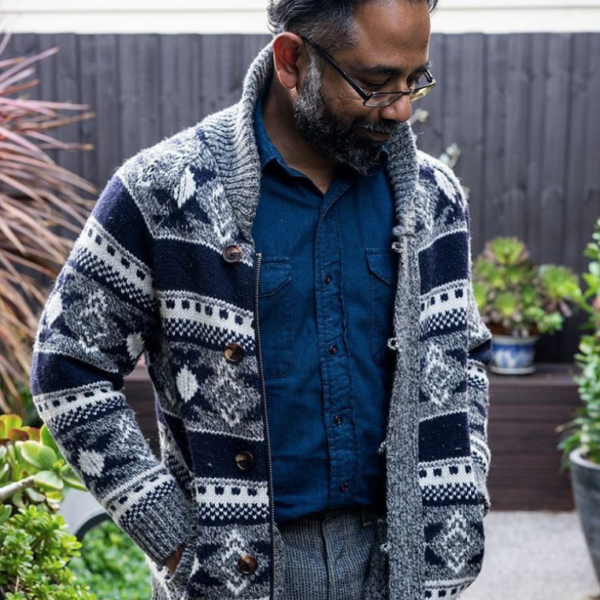 Chamula’s cardigan isn’t technically a cowichan since it’s not knitted by Cowichan people in Canada, but it’s in a similar style and looks great with jeans. RRL also occasionally makes them, along with their button-front pieces. Lastly, Inverallan has some cabled cardigans that sit between these two worlds. They’re not as rugged a cowichan, but they’re still a bit more casual than what you’ll find at The Armoury. For something with a slightly dégagé sensibility, you can try the belted cardigans at Eidos and Ralph Lauren. And for something more affordable than the options above, wait for sales to drop at J. Crew, Club Monaco, and (yes) Abercrombie & Fitch. From perusing them in-store, I found the first two to be better made, but a little thinner. Abercrombie’s has the thicker look of more expensive cardigans, but the quality of the wool seemed less great. At least at the store I was at, the cardigans were already pilling on the rack, but they’re also relatively inexpensive.